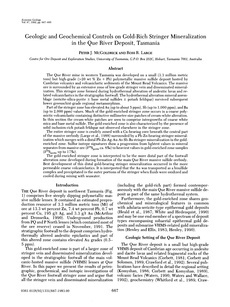 The Que River mine in western Tasmania was developed on a small (3.3 million metric tons) but high-grade(> 20 wt % Zn + Pb) polymetallic massive sulphide deposit hosted by Cambrian volcanics and volcaniclastic sediments of the Mount Read Volcanics. The massive ore is surrounded by an extensive zone of low-grade stringer vein and disseminated mineralization. This stringer zone formed during hydrothermal alteration of andesitic lavas and related volcaniclastics in the stratigraphic footwall. The hydrothermal alteration mineral assemblage (sericite-silica-pyrite ± base metal sulphides ± potash feldspar) survived subsequent lower greenschist-grade regional metamorphism. Part of the stringer zone has elevated Au (up to about 5 ppm), Sb (up to 1,000 ppm), and Ba (up to 2,000 ppm) values. Much of the gold-enriched stringer zone occurs in a coarse polymictic volcaniclastic containing distinctive millimeter-size patches of cream-white alteration. In thin section the cream-white patches are seen to comprise intergrowths of coarse white mica and base metal sulphide. The gold-enriched zone is also characterized by the presence of solid inclusion-rich potash feldspar not observed elsewhere in the stringer zone. The entire stringer zone is crudely zoned with a Cu-bearing core beneath the central part of the massive orebody (Large et al., 1988) surrounded by a Pb-Zn-bearing stringer mineralization which merges with a distal Pb-Zn-Ag-Au-As-Sb-Ba stringer mineralization in the gold-enriched zone. Sulfur isotope signatures show a progression from lightest values in mineral separates from massive ore(ä34Spyrite ca. 8‰) to heaviest values in gold-enriched zone samples (ä34Spyrite up to 17‰). The gold-enriched stringer zone is interpreted to be the more distal part of the footwall alteration zone developed during formation of the main Que River massive sulphide orebody. Best development of this distal gold-bearing stringer mineralization occurred in the more permeable coarse volcaniclastics. It is interpreted that the Au was transported as a bisulfide complex and precipitated in the outer portions of the stringer when fluids were oxidized and cooled during mixing with seawater.